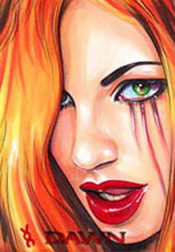 The world of comics has no shortage of beautiful ladies. Joseph Michael Linsner's Dawn is one of the most well known outside of the Marvel and DC Universes. While the character has been featured in several trading card products in the past, none are as lavish as 2013 Breygent Dawn: New Horizons. Boxes promise a total of three premium inserts. These include sketch cards, autographs and comic panel cards with pieces of original comics embedded inside them. Sketch cards include many of the top artists working in the industry today: Sean Pence, Jim Kyle, Veronica O'Connell, Tim Shay and Gary Kezele, to name a few. Dawn creator, Joseph Michael Linsner has sketch cards in the product too, although they're an incentive for those ordering three cases. 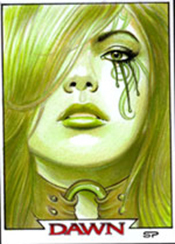 The 2013 Breygent Dawn: New Horizons base set has 72 cards, all featuring lush artwork. Among the basic inserts is a nine-card puzzle. Here's a tentative list of artists contributing sketch cards to the set. I am looking for dawn new horizons comic panel cards. any cp1 card cnad any cp3 card.